My husband likes to point out that our two-year-old knows more Spanish than he does, and it’s true. Some of that I owe to Dora the Explorer, but the rest of her fluency comes from the lessons I’ve been giving her on a daily basis. So far, she knows the Spanish words for most of her colors, most of her favorite animals, many household objects, and she can almost count to 10 in Spanish. I’ve been trying to encourage her bi-lingual growth with some Spanish language learning apps and have also started using DVDs, CDs and books to continue the lessons. According to linguistic experts, teaching your children a second language has a positive effect on their intellectual development and actually improves their understanding of their native language. Plus, it helps open the door to other cultures and in our increasingly global world, can set them up in the future for great opportunities. But how do you get started? The best way for kids to learn a second language is through immersion, basically surrounding them with the language. Little Pim makes that a little easier. They have DVDs, CDs and books, which feature animated lessons for kids ages 0-6, in ten languages, including English, Spanish, French, Chinese and Italian. The videos were created by filmmaker and mom Julia Pimsleur Levine to fill a need in the children’s video market for a top-quality, language-learning video series. To create the videos, she worked with a team of animators, childhood development experts, and linguists. The result is a lesson that’s as effective as any that I’ve ever seen. Our daughter definitely seems to enjoy her daily lessons, although I wonder if she really understands what “Spanish” is and why there are two different words for the same object. Maybe not yet, but someday she’ll understand and she’ll be a lot better off for it! If you’d like to purchase Little Pim, you can get a 20 percent discount using the promo code LPBLOG on Little Pim’s website. 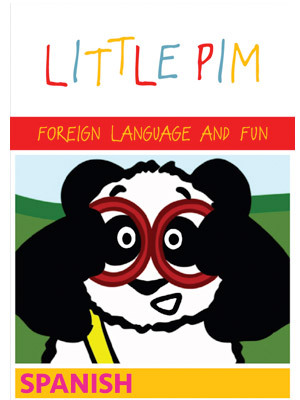 The folks at Little Pim have also been nice enough to donate one of their learning DVDs to one lucky reader – the reader even gets to choose the language! Enter using the Rafflecopter below. I received a Little Pim gift set for free for the purpose of this review. I only recommend products or services I use personally believe in. All opinions are my own. My boys also know quite a few words thanks to Dora and Diego lol great giveaway! I would like to teach my kids Chinese. That is one of their ethnicity. I would love to start teaching my infant Spanish! I’d love to teach my nieces and nephews Spanish, but Chinese will be a great language in the future I’m sure. I would love to teach my son Spanish I took Spanish in high school and he is always asking me how to say certain words…. I forgot so many of them it would be nice to refresh my own memory too! I have heard so many good things about Little Pim! I love that there is such a great program to help kids learn another language! I totally agree! My kids are in french immersion school. I was worried at first that they might lag behind in English, but I find it has enhanced ever area of the life! Dora is a fav in my house too! Since I do have a bit of French in my background, I would love for my daughters, as well as myself, learn French. My daughter has also learned lots of Spanish with Dora, it’s her absolute favorite show! That sounds great! We’re actually required here to learn French so I would do the French! I really want my kids to learn Spanish, but in addition to that, I think they should also learn Chinese. It’s the “Spanish” of their generation. I love Little Pim! My son and daughter used Little Pim Italian. It helped my son learn some of the language my daughter is learning in high school; while helping my daughter review what she was learning. Excellent product. I would love to be able to teach my son Spanish! it was my minor in college, and I’d love to pass on my love for this language! Awesome product! Thanks for sharing and giveaway!